Stylish nylon cat collars in three trend-setting Animal prints. Available in Cheetah, Giraffe and Zebra colors. Breakaway plastic buckle and a jingle bell. 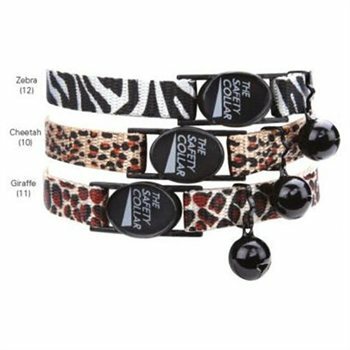 -Trendy animal print designs make these cat collars a true find. Nylon collars have a plastic breakaway buckles that release upon snagging to keep cats safe. -Dimensions: 0.38″ W x 8-12′ L.